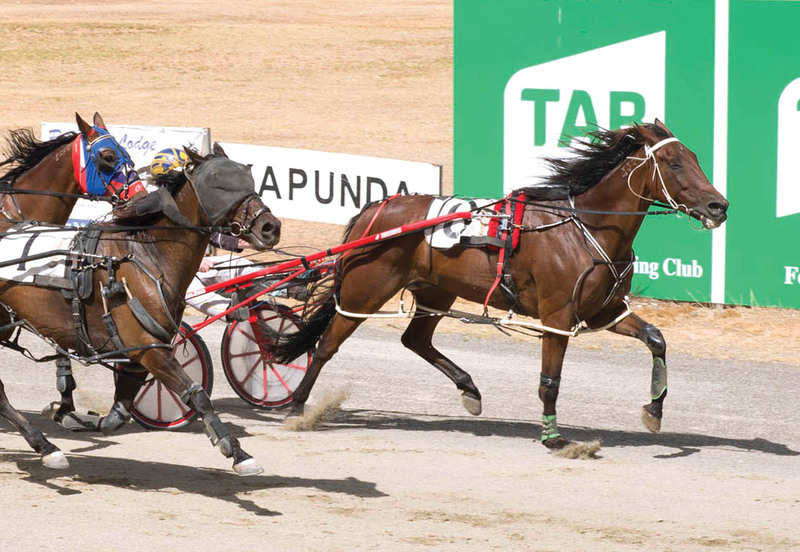 IT’S fair to say fate played a massive role in the outcome of yesterday’s Ray Smith Memorial at Kapunda. Named in honour of the astute horseman who passed away in mid 2018, the feature was captured by Straight Thru Blue. While that doesn’t sound extraordinary, it was the gelding’s first win since November 2017. But add the fact Straight Thru Blue was partnered by Smith’s grandson, Matthew, who was having his first drive behind the seven-year-old, and a clearer picture begins to unfold. Matthew was only given the call-up because Straight Thru Blue’s regular driver – Dean Girardi – had to take the reins behind another runner which he trains. Yet, not long after acceptances Girardi’s horse was scratched. “It was the first time I had driven him and it was only because Dean had a horse in it so he couldn’t drive and he recommended me,” Matthew said. “Then Dean’s horse got scratched not long after I was given the drive. With Straight Thru Blue racing at the tail of the field and in desperate need of an opening at the top of the home stretch, a passage along the pegs – which makes the parting of the Red Sea appear amateurish – presented itself. Quickly taking advantage of the gap, Matthew steered Straight Thru Blue to a half-neck win from Sutter Man, with Celestial Daybreak two metres away third. The rank outsider at $31.40 on the tote, the son of Panspacificflight rated 2:00 over 1800 metres. “I was lucky to sneak through on the pegs,” Matthew said. “I was told he had been working well and Christopher (Nicol, trainer) was happy with way he is going. Rounding out the ‘fate factor’ is yesterday doubled at Smith’s birthday! “He would have been 76 yesterday,” Matthew said. “The racing calendar worked out great with the timing for his birthday. “To win the first running of the race in my grandfather’s honour on his birthday is just massive.